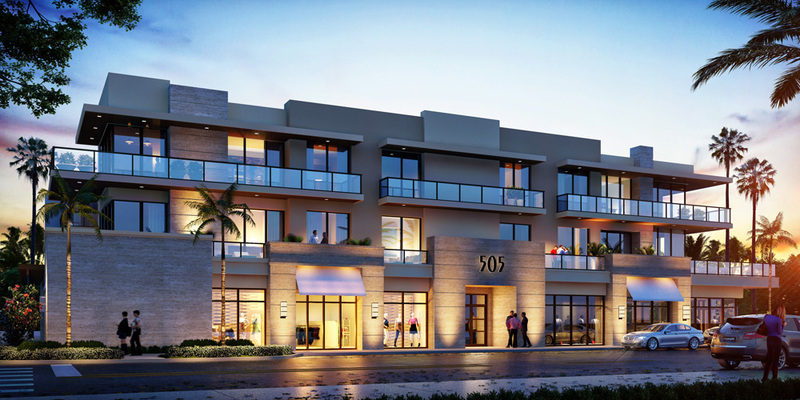 Live the pied-a-terre lifestyle in the heart of Olde Naples on the corner of 5th Avenue South and 9th Street South. This third floor residence is merely steps to award-winning restaurants, galleries and shopping and is a perfect second home retreat or investment option. Gleaming wood floors, an updated kitchen, tastefully appointed bathrooms, floor to ceiling arched windows, spacious closets and a generous balcony awaits its newest owner in style. With only three residential units within the building, ownership is rare. Access to the residence is via a secure entry elevator and a carport offers one covered parking space. A second space and visitor parking is also provided. Investors: this property may be leased 12 times per year and offers an excellent rental rate based on its incomparable Olde Naples location. Fatima S. Khokhar/ Downing Frye Realty, Inc.
Modern style meets the authenticity of Naples in this eight-unit complex in the heart of 5th Avenue S surrounded by upscale fashion and jewelry boutiques, spas, art galleries and more. Artfully designed by Stofft Cooney and exquisitely detailed by Renee Gaddis Interiors, 505 on Fifth is the epitome of coastal luxury. Units ranging from 2,100 to nearly 2,500 square feet, all with balconies overlooking the city lights illuminating the palms. Residents will enjoy 10 foot ceilings, linear fireplaces, gourmet Wolfe, Sub-Zero and Bosch appliances, 2 secure parking spaces and the freedom to choose either fully decorated or a decorator-ready blank canvas. The sophisticated lobby and common areas will have even the most discerning home buyer delighted to call 505 on Fifth their Naples home.